A motu is a tiny outlying island hugging a coral reef. No trip to French Polynesia is complete without experiencing one of these palm-fringed hideaways. You get to visit two of them. Swim, snorkel or kayak in crystal-clear turquoise waters. Or, kick back your heels and laze on the silky white sand. The private motu of Taha'a Island features a beach-side barbecue of seafood, steak and chicken plus a wide choice of beverages. The quiet, secluded motu of Bora Bora offers only a limited choice of snacks and beverages. However, it has a romantic, isolated setting. One couple told me they imagined they were castaways on a deserted tropical isle. Bora Bora and Moorea are world famous for their watersports. 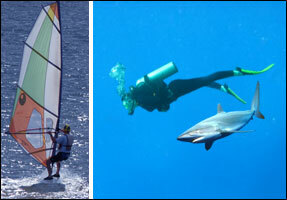 Popular activities include snorkeling, scuba diving, windsurfing, parasailing, dolphin watching and shark feeding. You can ride a sailboat, waverunner, submarine, and glass-bottom boat. You can even don a diver's helmet and walk underwater with the fish.